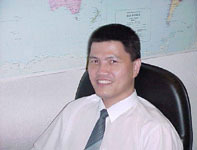 Kelvin Chua is the Chief Software Architect of AccPro Computer Systems Pte Ltd. He reads his Doctorate Degree in Business Administration from University of Newcastle. He also holds a Master Degree in Business Administration/Information Technology from Leicester University in United Kingdom. "Our business is to provide customers with advanced and stable business software solutions."